First of all, why do Chinese people like dumplings “饺子 jiǎo zi” so much? One of the reasons is that in the Chinese food culture dumplings have so much home flavor and good meaning. 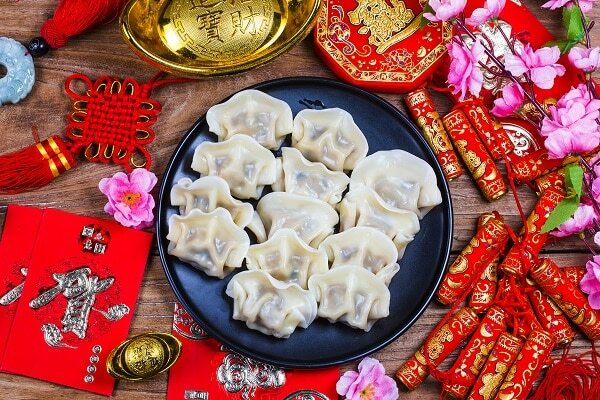 To start with, the shape of dumplings looks like an ancient coin called “元宝 yuán bǎo” which obviously has auspicious meaning. Also, making dumplings is a team work and it is a time that family members and friends can gather and do something together. In today’s Chinese lessons, I’m going to share with you the culture of dumpling eating and some simple Chinese phrases related to eating. The next question is: how are dumplings made? It can seem like a complicated process, but don’t stress. It is very likely that the host will get the skin “皮 pí” and filling “馅 xiàn” ready beforehand. The skin is made from flour. The filling is usually a mixture of minced pork and vegetables. However, the filling can be more “creative”. You can come up with a kind of filling which has different ingredients that you like. The making of dumplings is not that hard, just remember to make sure that you wrap the filling up tightly. That’s why people say “包饺子 bāo jiǎo zi”; “包 bāo” literally means wrapping something up. Otherwise, when being boiled, the dumplings will open up. If you are with a group of friends, after the dumplings are ready, it is very likely that you will share the dish. You might be offered a pair of chopsticks ”筷子 kuài zi”, but the host might offer you a fork “叉子 chā zi”, or he might offer you a choice. When making choices, “要 yào” is a really useful word, it means “want”. So you can say “我要筷子 wǒ yào kuài zi” which means “I want/I’d like chopsticks”, or “我要叉子 wǒ yào chā zi ” which means “I want/I’d like a fork”. Also, dumplings are usually served with sauce, so you might be asked whether you want source like vinegar “醋 cù” or chili sauce “辣酱 là jiàng”. Again, you can use “要 yào” to make choices. “我要醋 wǒ yào cù” means “I want/I’d like vinegar”, “我要辣酱 wǒ yào là jiàng” means “I want/I’d like chili sauce”. Many Chinese dishes are served while hot including dumplings, so you might keep hearing people say “趁热吃 chèn rè chī” which means “eat while it is hot”, because dumplings do taste better while hot. When eating, you can always compliment the food by saying “好吃 hǎo chī” which means “yummy”. On one hand, I’m sure the host will be very happy to hear this from you. On the other hand, don’t be surprised that people keep asking you to eat more. It is true that it’s polite to eat more when being offered, but it’s okay to stop if you’re really full. So when you’re full, here is the expression to use “我吃饱了 wǒ chī bǎo le” which means “I’m full”. Frozen dumplings can be found everywhere in the supermarket nowadays, but it is still different if they are hand-made and home-made. If you get the opportunity to be invited to a Chinese friend’s home and participate in making dumplings yourself, it can be really fun. A dumpling party can be a great opportunity to get to know Chinese culture and learn to speak Chinese. You may even gather people from your Chinese class to have a dumpling party together! Ready to learn Chinese? Find out more about our Chinese language courses, click the button below.